They teased us last month…and now, Disney has made it official: Marvel characters are coming to Disney Infinity. At a press announcement Thursday in Hollywood (covered by Crave gaming site Destructoid), the Mouse took the wraps off Disney Infinity 2.0: Marvel Super Heroes, the new version of Disney's open world "creative sandbox" game, which will feature Marvel characters, headlined by (who else?) The Avengers. The game, which will debut later this year, will be available on the same platforms as Disney Infinity 1.0 (Wii U, Xbox 360, PS3, PC, and mobile) as well as next-gen consoles Xbox One and PS4. All 1.0 saves, characters, power discs and toy boxes will transfer over to the new consoles, developer Avalanche confirmed. 2.0's story is being handled by Marvel star writer Brian Michael Bendis, who promised a mind-blowing adventure that would help make Disney Infinity the creative ground zero that comics were for the previous generation. While we'll have to wait and see just how mind-blowing it is, we do admit — it's hard not to be interested in playing with the 20+ new Marvel characters Disney is rolling out. Along with Avengers Captain America, Iron Man, Thor, Hulk, Hawkeye and Black Widow, the preview video for the new game also teased upcoming arrivals for characters like Spider-Man, the Winter Soldier, Iron Patriot, Loki and MODOK. As expected in Disney's cross-promotional nirvana, the Guardians of the Galaxy are also in the mix, including Rocket Raccoon and Groot. 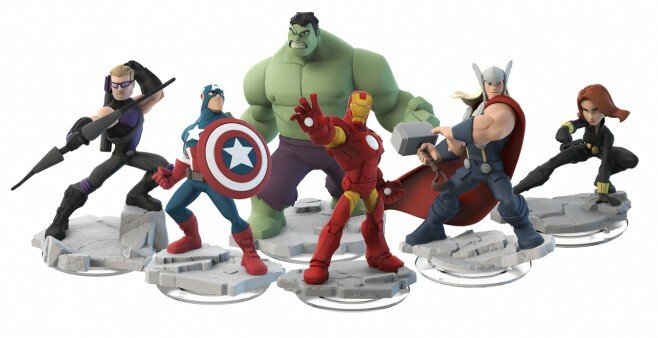 The $75 Disney Infinity 2.0 starter pack, including Thor, Iron Man and Black Widow, should hit store shelves this fall.